My first semester at ITP is complete, and I enjoyed it very much. The workload was intense but that never bothered me. Every day I got out of bed excited for the things I would do that day. Currently I am making improvements to this website. I made many enhancements to the style sheets and added a logo to the side menu. I also wrote extra documentation that I didn't have time for during the semester. Before the next semester starts I hope to move the hosting from github to S3. If I have time, I'll add a P5 animation to the homepage. The music is Shizaru by Lie Too Fine. This is a Windows game I can play with a game controller. I've also compiled this for an Android phone but can't try it because I don't have the proper USB-C cable. It seems Unity can also make a virtual reality version of this too. Can't wait to try this out on my new Google Pixel 2 phone. The Great Heart project is the result of the hard work and effort of Camilla Padgitt-Coles and James Schmitz. 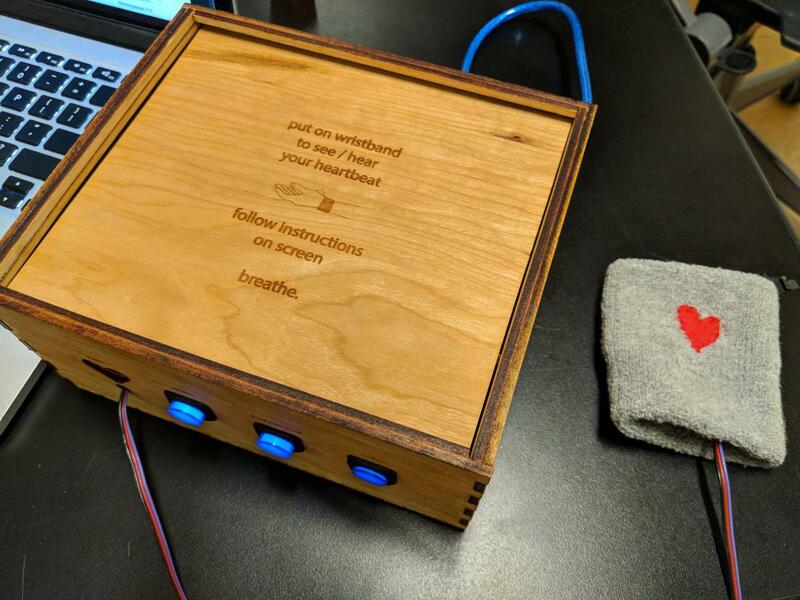 "Great Heart" is a collaborative project created for Tom Igoe’s Introduction to Physical Computing class by Jim Schmitz and Camilla Padgitt-Coles. The project uses a pulse sensor to detect the user's heartbeat and translate it into sound. The user can hear their heart rate sonified and follow breathing visualizations which are designed to guide their breathing to help users achieve inner peace, release anxiety, and slow their heart rate down. The user puts on a wristband with the pulse sensor attached and sits as long as they choose with the sounds and visuals. Our last Learning Machines assignment is to calibrate the hyperparameters for a Multilayer Perceptron. Patrick gave us a working model using the MNIST database of handwritten digits. The model uses a Restricted Boltzmann Machine to reduce the dimensionality of the data and then a Multilayer Perceptron to classify the digits. I was able to achieve an out-of-sample accuracy of almost 96%. This is in line with the results of other researchers. For our last Animation assignment we created a simple game or experiment in Unity. I created a maze game. When I was learning how to program a computer many years ago I loved to make mazes. Using our Commodore 64 computer I made games involving mazes and simple characters that would find their way through the mazes. I loved those games. The character moving through the maze would literally be a single character moving up, down, left, and right through a 2D maze. I thought it would be fitting if my first Unity game was also a maze game, but with more advanced graphics. Our next assignment is to use a Multi-Layer Perceptron to study a dataset. The dataset I selected is the commonly studied Poker Hand data. Each record contains data for 5 playing cards and a poker hand classification, such as full house or straight. This dataset proved to be difficult to work with. It is an example of an imbalanced dataset in that the more common poker hands like two-of-a-kind are heavily represented and the less common hands like straight and flush are not. I found that the Perceptron was able to correctly classify some poker hands very well while performing terribly for others. I suspect a very different training methodology is required to properly train a Perceptron with this dataset. Our final project continues to progress towards our final presentation next week. Our project is in good shape and we were even able to do some user testing yesterday with some people in the lounge. I'm looking forward to tomorrow's user testing and additional feedback. We made progress on several fronts. First, I collected much more raw pulse data and studied the data in Python. I was able to identify the shortcomings in the provided pulse sensor code and make some improvements. This is documented in my previous post. Our project uses this modified version that has noticeable improvements over the original version. It still isn't perfect but for people for whom the sensor gets a good reading, it works very well. This modified version has been shared with two other groups who are also using the pulse sensor. 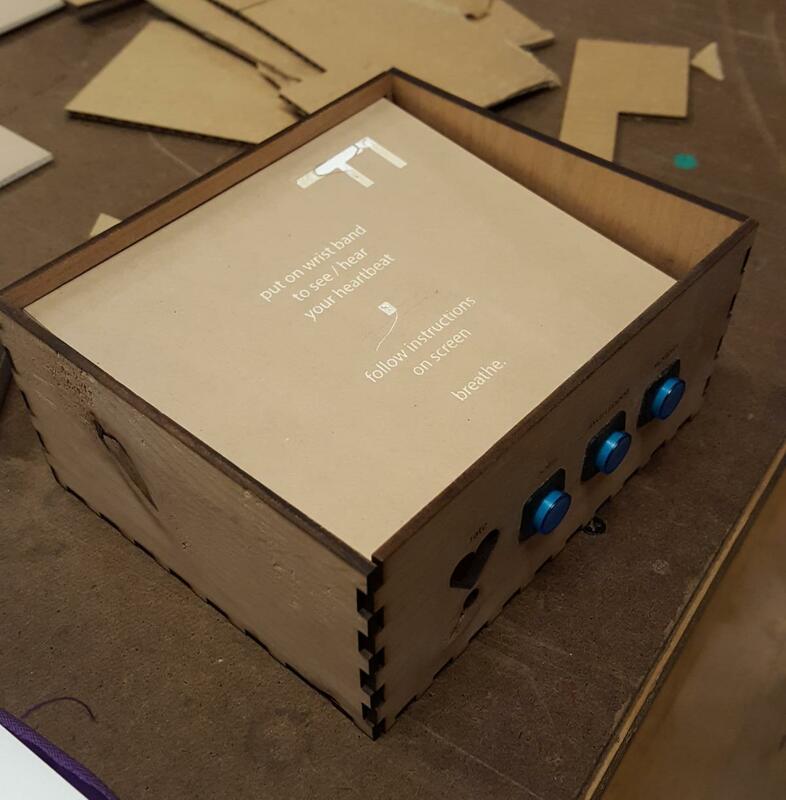 Our Physical Computing final project depends on a Pulse Sensor to detect a user's heartbeat. The people at World Famous Electronics created an Arduino library for their customers to use with their sensor. The library adds a lot of value because it provides users with a well researched algorithm for using the sensor to properly detect a heartbeat. Pulse Sensor users don't have to re-invent the wheel and code their own algorithms. Writing your own algorithm to do this is difficult, and the one provided by the company is better than the one that I came up with for our midterm. Still, the provided algorithm isn't perfect. For some people it seems to miss some heartbeats and add extra heartbeats. A fellow ITP student, Ellen, showed me that it would have odd spikes in the beats-per-minute (BPM) value. It wasn't clear why this was happening. Since I previously had been analyzing the sensor's data in Python, I came up with a plan to figure out why the Arduino code was doing this and to figure out if there was anything I could do about it. After studying the data and making some plots, I was able to make some improvements the algorithm. It still isn't perfect but my changes address many of the weaknesses of the algorithm. The original Pulse Sensor Arduino code is available online on GitHub. I am sharing this code with my fellow students who are also using the same sensor. After our projects are complete I will submit my modified code to GitHub as a pull request to share with the rest of the community. Camilla and I have made a lot of progress on our final project.